My grandma's recipe for the iconic light and refreshing dessert that includes mandarin oranges, coconut, marshmallows, pineapple and Cool Whip. Perfect for summer! 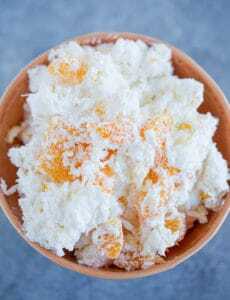 Place the oranges, pineapple, coconut and marshmallows in a large bowl. Add the Cool Whip and, using a rubber spatula, gently fold the mixture until all of the ingredients are evenly distributed. Cover and refrigerate until ready to serve. Ambrosia can be stored in the refrigerator for up to 3 days.